This is a standards-based simulation for middle school, developed to help students visualize how total energy is conserved in a simple pendulum. It depicts a child swinging on a swing suspended from a stationary point. Students can drag the swing to different heights, then activate the motion. As the swing moves in periodic motion, energy bar graphs are simultaneously displayed that show changing levels of kinetic and potential energy. 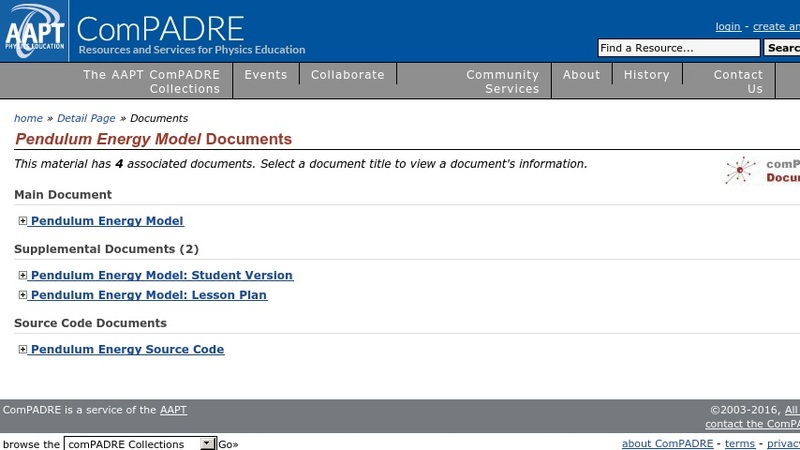 The simulation is accompanied by a lesson plan and printable student activity guide. This item was created with Easy Java Simulations (EJS), a modeling tool that allows users without formal programming experience to generate computer models and simulations. To modify or customize the model, See Related Materials for detailed instructions on installing and running the EJS Modeling and Authoring Tool.